On Sunday, November 8, 2015 at 2:00 p.m. in the Church, St. Philip’s Friends of Music presents Ronstadt Generations y Los Tucsonenses. Representing five generations in North America, Ronstadt Generations continues the family’s musical traditions with Michael J. Ronstadt (younger brother of Linda) and his sons, Michael G. and Petie. Multi-instrumentalists and solo performers in their own right, they present an exciting repertoire that preserves the traditional Southwestern and Mexican songs of their heritage while offering innovative original material. New compositions place them on the cutting edge of multiple, blended genres, stretching the boundaries of folk, blues, jazz and beyond. Rich harmonies sung in English and Spanish are accompanied by outstanding cello and guitars. Individually and together, Stateside and across the pond, the trio’s worldwide touring and recording credits include such diverse artists as Linda Ronstadt, Los Lobos, Dixie Hummingbirds, David Bromberg, Nydia Rojas, Tish Hinojosa, Muriel Anderson, and Mariachi Vargas, to name a few. In 2012 three veteran musicians – Alex Flores, Sam Eagon and Aaron Emery – came on board with versatile talents to form the six-piece ensemble Ronstadt Generations y Los Tucsonenses (the Tucsonans). First performing with Ronstadt Generations at a local Tucson gig, the sextet cemented the relationship with the recording Prelude. Alex, Sam and Aaron bring to the table a variety of experience and influences. Playing tenor saxophone, bass and drums, respectively, they add a colorful dimension to an already powerful presentation that respects tradition while exploring innovation. Enjoy a fascinating musical journey with Ronstadt Generations y Los Tucsonenses. The suggested concert admission is $20 per person. The mission of Friends of Music is to enrich the musical experience of the parish and community through events such as concerts, outreach, education, scholarships, commissions, and support of special musical events. For more information see http://www.friendsofmusictucson.org. On Saturday, October 24, at 7:00 p.m. in the Bloom Music Center, St. Philip’s Friends of Music is proud to introduce to Tucson a fresh idea of enjoying a concert! 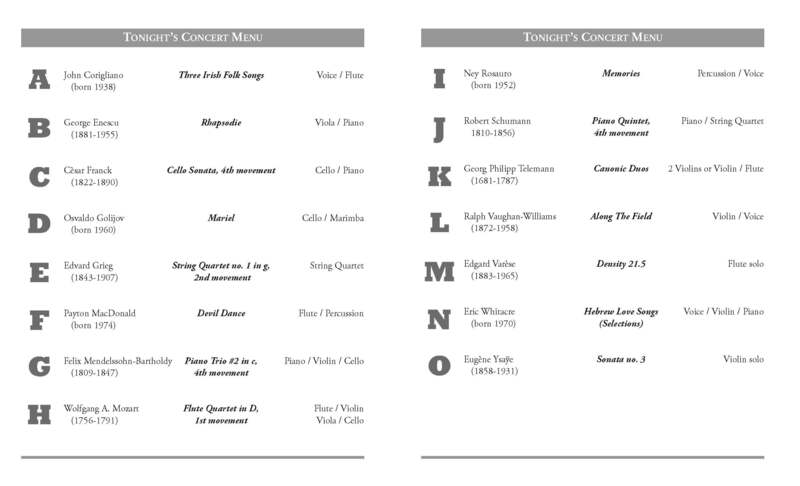 St. Philip’s Musical Menu Concert includes violinist Ben Nisbet and seven highly accomplished chamber musicians. Your ticket will have a number. If your number is drawn, you may choose what you’d like to hear from a musical menu that lists pieces by composers ranging from Mozart and Mendelssohn to Franck, Bernstein, and several outstanding contemporary composers. A semi-round setting at St. Philip’s Bloom Music Center will create a relaxed and intimate atmosphere of musicmaking. Admission is $25 per person. To purchase tickets click here. St. Philip’s is located at 4440 N. Campbell Avenue at River Road. Ample parking is available in the north parking lot. The Bloom Music Center is to your right as you come down the breezeway from the north parking lot. The Friends of Music phone number is (520) 222-7277. Violist Candice Amato enjoys a versatile career as a chamber musician, recitalist, and orchestral player. A newly appointed member of the Tucson Symphony, she will also join the St. Andrew’s Bach Society and True Concord Voices and Orchestra for the 2015-2016 season. She recently spent two summer seasons performing in the opera orchestra of the Castleton Festival under the direction of the late Maestro Lorin Maazel. A passionate supporter of music by composers of the current generation, she has performed with composers and conductors Robert Morris, Steve Reich, Chen Yi, and Esa-Pekka Salonen, among others. She recorded an album of music by Michael Tenzer with the highly acclaimed Ossia New Music Ensemble, released by New World Records. In addition to performing in concert halls, Candice is dedicated to bringing music to the public in nontraditional venues, including hospitals, schools, women’s shelters, and health care centers for the homeless. She is currently the Artistic Director of the Tucson chapter of “If Music Be the Food,” a concert series created by Carol Rodland in Rochester, N.Y. to benefit the hungry in communities around the country. Candice received a BM from the Eastman School of Music and a MM from the Peabody Conservatory. She plays on a viola made in 1878 by Georges Chanot I. A native of Pittsburgh, Pennsylvania, Erika Burkhart enjoys an active career singing and teaching in Tucson. As a concert artist, she has appeared with the Tucson Symphony Orchestra in Bach’s Magnificat and Vivaldi’s Gloria, and with the True Concord Voices and Orchestra (previously Tucson Chamber Artists) in repertoire ranging from Bach’s Mass in B minor to the world premiere of Paulus’ Prayers and Remembrances. Erika’s opera credits have included Carolina in Cimarosa’s Il Matrimonio Segretto, Sarah Good in Ward’s The Crucible, Rose Maurrant in Street Scene, Despina in Cosi fan Tutte, and Zerlina in Don Giovanni. She has spent two seasons as a Tucson Teaching Artist with Arizona Opera, performing educational shows in schools across Southern Arizona, and is a music director at St. Paul’s United Methodist Church. Erika is a dynamic performer, enjoying everything from Baroque oratorio and Romantic opera to contemporary art song and improvisation. Erika completed her Bachelor’s at the University of Arizona, where she was involved with the university’s Opera Theater and Arizona Choir, as well as other ensembles. She has won the Southern Arizona Opera Guild’s “Quest for the Best” competition, the Amelia Rieman Opera Competition, and the Arizona District Metropolitan Opera National Council Audition. Freelance percussionist Paul Gibson performs with many of Tucson’s most prestigious musical organizations including the Tucson Symphony Orchestra, Tucson Chamber Artists (now True Concord Voices and Orchestra), and Artifact Dance Project. He can be heard regularly at Lonely Street Productions showcase concerts throughout Arizona and with Michael P. & the Gullywashers. Additionally, Paul is Lead Drummer of Tucson & District Pipe Band and is a member of the Los Angeles Scottish Pipe Band, one of only two Grade One bagpipe bands in the United States. He has performed in Carnegie Hall in New York City with the Tucson Philharmonia Orchestra and traveled on two international tours of China with Artifact Dance Project. Paul received a master’s degree in percussion performance from Rowan University and holds a bachelor’s degree in music from The University of North Texas. A native of Oakland, California, cellist Ian Jones attended UCLA and Indiana University, continuing at IU for studies with Eric Kim and Janos Starker. For the 2006-07 concert season, Ian joined the cello section of Honolulu Symphony. In 2008 his string quartet was awarded the school-funded Kuttner Quartet fellowship at IU. He has benefited from close collaboration and coaching with Indiana faculty members including Atar Arad, Alexander Kerr, Paul Biss and Yael Weiss, and has collaborated onstage with Joshua Bell and members of the Orion Quartet among others. Ian joined the Tucson Symphony Orchestra in 2011, where he was recently appointed Assistant Principal cello. He earned his master’s degree in performance in 2013, studying with Mark Votapek. For the past three years he has appeared in the Breckenridge Music Festival’s Winter Concert Series, and for the summer of 2014 joined the BMF for their regular summer concert season. An avid tennis player, Ian competes in local USTA leagues in Tucson and the San Francisco Bay Area. Alexander Lipay has been principal flute of the Tucson Symphony Orchestra since 2006, holding the same position with True Concord Voices and Orchestra and St. Andrew’s Bach Society Chamber Orchestra. He has performed as guest principal flute with the San Diego Symphony and the Seattle Symphony. He also served as principal flute of the Tucson Chamber Artists and the Sunriver Music Festival. Lipay has performed as a soloist with the Tucson Symphony, Seattle Symphony, St. Petersburg Philharmonic, St. Petersburg Symphony, Hermitage Orchestra, Tucson Chamber Artists and Arizona Chamber Orchestra. He has also appeared as a soloist at many music festivals including the prestigious International Festival “Musical Olympus” in St. Petersburg, Russia, and the International Music Festival in Moulin d’Ande, France. He was the 1st prize winner of several competitions held in the U.S., including the MTNA Young Artist National Woodwind Competition in 2004. Mr. Lipay holds a Master of Music degree from the University of Southern California and a Bachelor of Music degree from the University of California Santa Barbara, where he graduated with two majors: flute and piano. Bulgarian pianist Elena Miraztchiyska completed her Master of Music Degree at the Yale School of Music and is currently a freelance pianist and piano teacher in Tucson. Miraztchiyska made her solo debut with the Bulgarian Chamber Orchestra in her home country at the age of 12 and since then she has performed as a concerto soloist with the Varna Philharmonic Orchestra, Arizona Symphony Orchestra, and the UNLV Symphony and Chamber orchestras. She has appeared in solo recitals in Bulgaria, Poland, Japan, Canada and the United States. Miraztchiyska is also a winner of numerous national and international competitions including the Grand Prize (a Steinway Model M grand piano) of the MTNA National Young Artist Competition in Toronto, Canada. Recent collaborative appearances have included recitals with the principal bass trombonist of the Boston Symphony Orchestra, James Markey, and the principal bassoonist of the Detroit Symphony Orchestra, Robert Williams. Benjamin Nisbet maintains a diverse performance schedule as a violinist. He holds a B.M. from Oberlin College Conservatory of Music, where he studied with Marilyn McDonald, and a Masters of Music from the University of Arizona, where he studied with Mark Rush. He has been a member of the Tucson Symphony Orchestra since 2006. He is a co-founder and music director of Artifact Dance Project, a professional dance company with multiple international tours to its credit. Ben serves as Concertmaster of True Concord Voices and Orchestra, and in that role, he appeared on that group’s debut recording for Reference Records as well as at their recent debut at Lincoln Center. In addition to True Concord, Mr. Nisbet has several recording credits to his name; including recently released albums by Ryanhood, Sweet Ghosts, Hello Dollface, Katie Haverly, Naim Amor, and many more. Ben also serves as the director of the St. Andrew’s Bach Society, one of Tucson’s most successful and longstanding summer concert series. Ben remains active in music education in the Tucson Community by teaching privately as well as in public schools, such as Tucson High School. He coaches the local youth orchestra, Tucson Philharmonia Youth Orchestra, and for nine years has served as a faculty member for Tucson Junior Strings’ Chamber Music in the Mountains. Since 2009, Mr. Nisbet has played on a violin crafted in 1920 by Ole Bryant. A Tucson native, Joseph Rousos-Hammond began playing the violin in his elementary school orchestra program and participated in Tucson Junior Strings and the Tucson Philharmonia Youth Orchestra. He attended Indiana University where he received a Bachelor of Music with Distinction, and went on to complete a Master of Music degree at the Chicago College of Performing Arts. Rousos-Hammond is currently Principal Second Violin of the Tucson Symphony Orchestra and a member of the TSO String Quartet. He has participated in festivals including the National Repertory Orchestra, Pacific Music Festival, Manchester Music Festival, and the Indiana University Summer Music Festival. He also performs with True Concord Voices and Orchestra, St. Andrew’s Bach Society, and in various other chamber concerts and solo recitals.